Reduction in construction time from a minimum of 20/25% in the residential sector upto a maximum of 30/35% in the hotel sector. Drastic reduction of site workers. Product fully in compliance with contractual requirements thanks to specific tests and inspections. Fixed costs, thus avoiding unpleasant economic surprises. Reduced costs for administrative personnel. Reduced costs for monitoring and management personnel necessary for the final phase. Reduction in construction cost by 15/20%. Contacts with one single partner. The Management believes in the importance of satisfying their customers as mush as possible and it is proven by its capability of producing customized products to satisfy any customer need. During the manufacturing process the bathroom pod is controlled by the workman operators on 25 check quality control procedures. The main characteristic of bathroom pod is high specific tiling which during the manufacturing process is controlled by 4 time. Offer customized cut-to-size items as completion of furniture. What is the Lifetime Homes Standard? The Lifetime Homes Standard was established in the 1990s to incorporate a set of principles that are implicit in good contemporary housing design. Good housing design, in this context, is thoughtful, forward-looking design that maximises utility, independence and quality of life, while not compromising other design issues such as aesthetics or cost effectiveness. The Standard is an expression of ‘inclusive design’. It seeks to provide design solutions in general-needs housing that can meet the changing needs of the widest range of households. Some of these solutions should be included in the design from the outset, while others can be incorporated at a later stage through simple and cost-effective adaptation. This will give many households more choice over where they decide to live, the type of property they live in and the range of visitors they can readily accommodate. Lifetime Homes properties are more convenient for most occupants and visitors, including those with less agility and mobility. The original design may negate the need for substantial alterations in order to make the dwelling suitable for a household’s particular needs. The added convenience provided by the Standard is helpful to everyone in ordinary daily life, for example when carrying large and bulky items, or pushing child buggies. The Standard is based on five overarching principles, as outlined below. These inform the rationale for the Lifetime Homes design requirements. Adaptability means that a building or product can be simply adapted to meet a person’s changing needs over time, or to suit the needs of different users. Many adaptations or adjustments within a Lifetime Home should be less disruptive, and more cost-effective, because the original design accommodates their future provision from the outset. from potential step-free access to upperfloor facilities. Sustainability, in this context, refers to strong and stable communities underpinned by essential accessible elements aimed at meeting current and future needs, including homes, facilities, goods and services (the design of which contribute to the long-term viability of the neighbourhood and community). The accessibility, flexibility and adaptability of a Lifetime Home all help to ensure longterm demand for, and desirability of, the dwelling. While sustainability is dependent on a range of factors, dwellings that offer this degree of accessibility and flexibility are likely to remain popular over time, for both existing and new households, and can therefore contribute to the creation of thriving and popular neighbourhoods and communities. • an accessible basin which may be located either on the adjacent wall, or adjacent to the cistern, but should not project into this approach zone by more than 200 mm. with the WC’s approach zone. 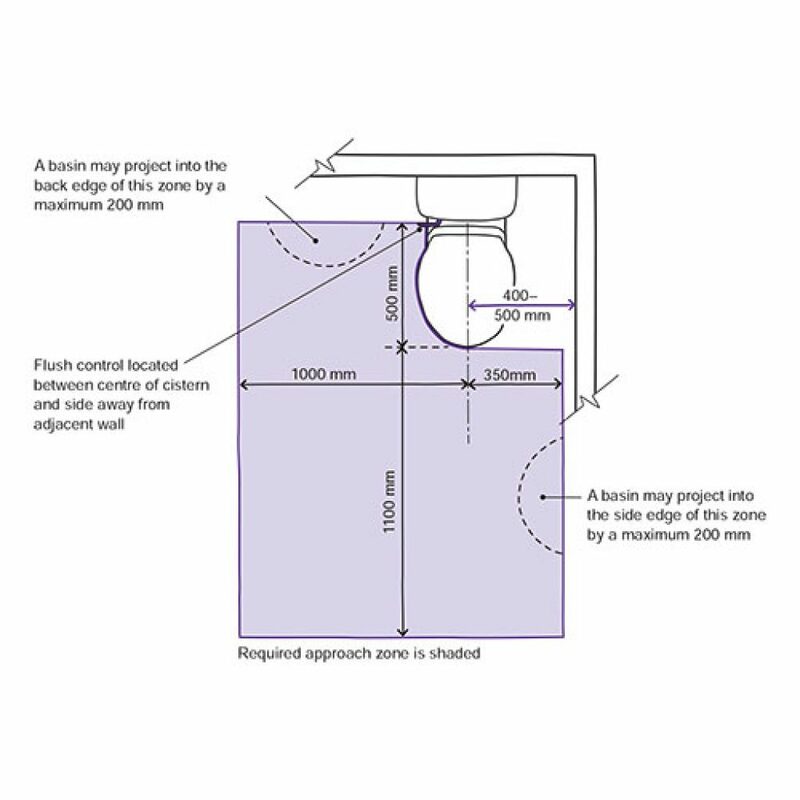 Unless provided elsewhere on the entrance level, the entrance-level accessible bathroom or the entrance-level accessible WC compartment should also contain floor drainage for an accessible floor-level shower. 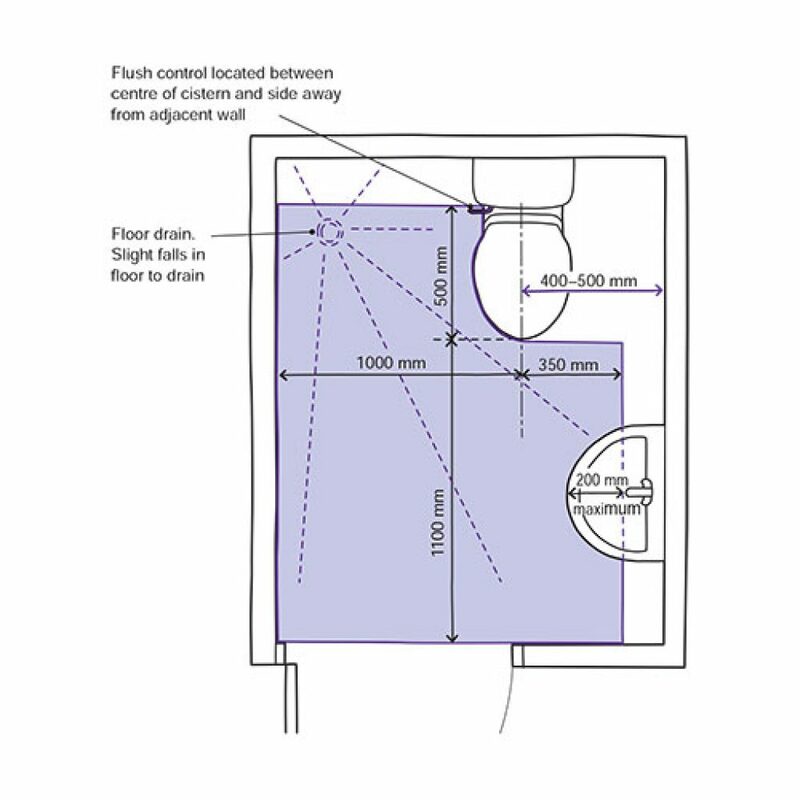 A floor construction is required that either provides shallow falls to floor drainage from the outset, or, where the drainage is initially capped for use later following installation of a shower, that allows simple and easy installation of a laid-to-fall floor surface to the capped drainage in the future. the showering catchment area. Crossfalls in the floor should be minimised. The drainage should be located as far away from the room’s doorway as practicable.